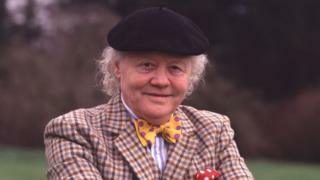 Actor Dudley Sutton, known to millions as Tinker Dill from TV's Lovejoy, has died aged 85.A veteran of the small and big screen, he starred opposite Ian McShane's roguish antiques dealer in the BBC comedy-drama from 1986 to 1994.Former colleagues and co-stars paid tribute to the "great actor and wonderful bloke", who was diagnosed with cancer this year.Sutton's agent said he died peacefully surrounded by friends and family.Born in Surrey in April 1933, he served as an RAF mechanic before enrolling in the Royal Academy of Dramatic Art. He was later expelled, but went on to join legendary stage director Joan Littlewood's Theatre Workshop group. After appearing in numerous plays during the 1950s and 1960s, Sutton's breakout screen role was the part of a gay biker in 1964's the Leather Boys.He later appeared in films such as The Devils, and The Pink Panther Strikes Again. But, speaking last year, Sutton acknowledged most audiences would remember him as Tinker, "regardless of all the different and diverse stuff" he had worked on.His other TV appearances included a special Christmas episode of BBC sitcom Porridge, in which he played hostage-taker Reg Urwin, and an instalment of ITV crime drama The Sweeney.In his later career he had a recurring role as conman Wilfred Atkins in EastEnders, as well as smaller parts in Holby City and Channel 4's teen drama Skins. Sutton died at the Royal Trinity Hospice in Clapham, south London.In July this year, he recorded a message from his bed praising staff at the NHS-run hospice, who he said had "cared for him beautifully".A message from his family said: "Today we're devastated by the loss of our beautiful Dudley, who leaves a gaping hole in all our lives. "We're grateful for the love expressed by friends and fans everywhere and for the extraordinary care he received at the [hospice], where he went out fighting for our NHS. "Former co-stars and showbiz friends also paid tribute to Sutton on social media.Fellow Lovejoy star Chris Jury, who played Eric Catchpole in the show, said he loved the actor "dearly". Keane singer Tom Chaplin, said Sutton had played a "wonderful lead role" in the video for his 2017 solo single Midnight Mass. Sad to hear about Dudley Sutton dying. He played a wonderful lead role in the video for my song Midnight Mass. Off-camera he was full of steadfast beliefs, warmth and fun! Inbetweeners actress Emily Atack, who appeared with Sutton in 2011 comedy Outside Bet, shared a photo on Instagram of the pair together on-set with the late Bob Hoskins.She described him as "a hilarious, warm, talented man". Quadrophenia star Phil Davis, who also featured in Outside Bet, described him as a "true original" who would be "greatly missed". Spandau Ballet musician and actor Gary Kemp mourned the loss of "one of Joan Littlewood's brood of amazing actors".